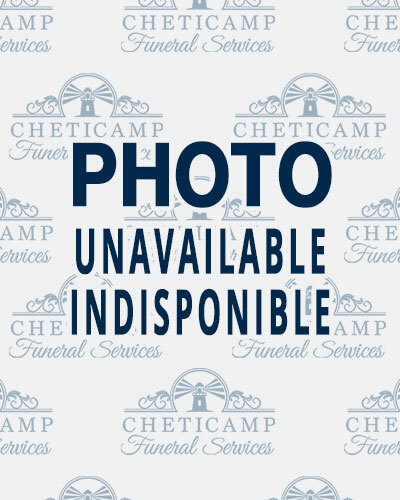 Age 81, St. Joseph du Moine, passed away peacefully Friday, March 29, 2019, in the Sacred Heart Community Health Centre. She was the daughter of the late Edmond and Sabine(Chiasson) LeBlanc. She is survived by son; John Gauthier, Bedford, N.S., and daughter; Ann (Gauthier) MacPhail, Mahone Bay, N.S. ; brothers, Leandre (Josephine) LeBlanc, Linus (Gisele) LeBlanc, both of St. Joseph du Moine, Eugene (Laurette) LeBlanc, Penticton, B.C. ; sisters, Dorothy (the late Alphonse) AuCoin, Cheticamp, and Sylvia (Don) Sullivan, Halifax; 3 grandchildren, Brenna and Aislin MacPhail, and Brooklyn Gauthier; sister-in-law, Gisele; and brothers-in-law, Jean-Guy and Tim. She was predeceased by her first husband John (Sonny) Gauthier and second husband Willie Joe Chiasson; brothers, Elias LeBlanc and Roland LeBlanc; and sister, Alberte LeBlanc. Visitation will be held on Tuesday, April 2, 2019, from 7-9 P.M. at the Cheticamp Funeral Home. Funeral mass will be celebrated on Wednesday, April 3, 2019 at 2:00 P.M., in Église St. Joseph, St. Joseph du Moine, with Father Peter LeBlanc officiating. Burial in parish cemetery at a later date. In lieu of flowers, donations may be made to Lifeline224 (in aid of Refugee Resettlement) or La Paroisse de St. Joseph du Moine. My deepest sympathy to you Anne for the loss of your mother. Jeanne Leroux informed me so my thoughts are with you. Hope to see you at an Algonquin retirees event in the near future so we can catch up on family news. In Antigonish.Thinking of your family today. I met when I first went to Cheticamp crab fishing in the early eighties . I spent a lot of time at the house visiting .Corrine always treated me like family I was very saddened to hear of her passing ….I would always visit whenever I was in the area .She was always glad to see me …..she will be missed …. Anne, and John, my heartfelt condolences on the loss of your mother. I only knew Corinne for 3 short years but she made a great impression on me. I am so glad that Shirley and I got to visit her in her house in Chetticamp. To her brothers and sisters, many of whom I met, know that she is at peace now! To the whole “Leblanc” / Chiasson/ Gauthier family. We are so sorry to learn of Corinne’s passing. Ray and I have many fond memories of visits with Corinne in recent years, and of course I recall my older cousin from my younger days. See you all at the funeral. We feel sad to hear of Corinne’s passing. She was such a lovely person. We regret we are unable to attend her funeral mass, however will be thinking of you all on Wednesday. I am so sorry to hear of your loss. Growing up in a small community, it hurts all of us when a loved one leaves us. My thoughts are with you both during this difficult time. Aux frères et soeurs de Corinne que je connais assez bien spécialement Léandre, toutes mes sympathies. Que le Seigneur l’accueille dans son amour et sa miséricorde et que les âmes des fidèles défunts de la famille de Edmond et Zabine reposent en paix! My deepest sympathy to John, Anne,grandchildren, brothers sisters & all Corinne’s family.She was a very dear friend since we first entered St. Martha’s School of Nursing in 1955. We have kept in touch all those years. I will miss our little telephone chats.Many great memories.I am sure that God will welcome her with out stretched arms.God Bless you all.